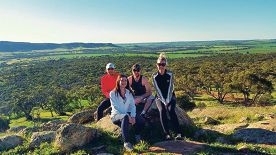 Team J2B2 – Jason Gilby, Carla Jordan, Ben Vroomans and |Bronwyn Polkinghorne – on a training hike for the Perth Hills Oxfam Trailwalker fundraiser. ‘I’ve always been involved in some kind of fitness event,’ said Ms Polkinghorne, who has now completed six City to Surfs, two HBF Run for a Reasons, two Colour Run paint races, two tower runs and The Stampede obstacle course. ‘My dad used to run long distances ” when I was really young, he did the Comrades Marathon in South Africa. Most Perth charity fun runs fundraise through entry fees, but Ms Polkinghorne’s next project required her team to go a step further and raise $2000 to take part. Oxfam Trailwalk challenges teams to hike through 100km of Perth Hills bush in 48 hours and the money raised goes towards global programs to fight the injustices that lead to poverty. To prepare, in addition to working full-time and undergoing some punishing weekend training walks with her team, Ms Polkinghorne is continuing an established habit of exercising six days a week, through running, walking or attending classes at her gym. She said having a healthy body was crucial to having a healthy mind and she welcomed the new challenge the Trailwalk posed. ‘I get such happiness and stress relief from fitness,’ she said. Ms Polkinghorne’s team ” J2B2 ” has already reached its $2000 target and is working to raise as much as possible before the Trailwalk from October 10 to 12. Donate or follow the team blog at https://trailwalker.oxfam.org.au/team/home/18397.